If you’ve expected anything else than a good ol’ comfort food recipe here: you’re in the wrong place! The first time I’ve ever seen a fish finger samdwich was about 7 years ago at a friends house: his mum had just made him, yes, a fishfinger sandwich. To be frankly honest: I didn’t know what to think of this and probably thought it was some kind of inside joke that I wasn’t aware of – but no: these British people were actually serious! It still took a few months until I tried my own first fish finger sandwich but I was a fan right away. Having been vegan for just over 4 years now, you can probably imagine that it’s been a while since I’ve enjoyed one of these. Not too sure what came over me to be honest – but all of a sudden I had the thought ‘hey, how about a fish finger sandwich’?! – so challenge accepted and hrre we go! 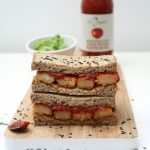 Luckily we’re in 2018 and there are some amazing vegan fish fingers out there – Quorn have really outdone themselves with their vegan fish fingers (and no, this post is totally not sponsored!) to be honest: whenever I see them in the store I pick up at least two packs of these – one for myself and one for Nick, cause ain’t nobody sharing these gorgeous creations! Definitely high on my list of dinner cravings – and so super easy to create! 1. Prepare the Quorn Fishless Fingers according to packaging instructions – I personally prefer preparing them in the oven, simply to not make them too oily. 3. Spread a little margerine on one side of each slice of bread, then toast the bread in the warm oven until golden. 4. Top with the fishless fingers and Ketchup and you’re ready to dig in! 5. To prepare the mushy peas for the side, simply place the frozen peas with a little oil in a saucepan on medium heat and slowly defrost the peas whilst stirring regularly. Once defrosted add a little salt and pepper and the mint. 6. If – like me – you like your mushy peas with some texture, simply use a potato masher to mash the peas in the saucepan. If you prefer a smoother texture, simply add the cooked peas to a food processor and blend until the desired texture is created. Finally: stir in the vegan mayonnaise for some extra creaminess and you’re ready to go!